Please call us so we can direct you to a location nearest you! NOT ALL DIGITAL FILES ARE CREATED EQUAL, WE USE TOP OF THE LINE PROFESSIONAL INDUSTRY GRADE HARDWARE ENCODERS TO CREATE HIGH QUALITY FILES FROM ANY FORMAT SUITED FOR ALL PURPOSES. OUR PROFESSIONAL ENCODERS HAVE VIRTUALLY DOZENS OF SETTINGS THAT MAINTAIN AND CREATE QUALITY VISUALS AND SOUND. (*CLICK ON LINK AND PULLS UP PICTURE OF SETTINGS). ALL DIGITAL TRANSFERS ARE FULLY SUPERVISED BY OUR TRAINED DIGITAL ARCHIVIST. YOUR MEDIA IS INSPECTED FOR QUALITY ISSUES BEFORE TRANSFERS. TIME BASE CORRECTION IS USED TO STABILIZE VIDEO WITH 3D NOISE REDUCTION TO MAINTAIN AND ELIMINATE ANY DIGITAL ARTIFACTS. WE CONSULT WITH ALL CLIENTS TO UNDERSTAND THEIR NEEDS & FILE TYPES SO TO ENSURE WE DELIVER THE FILE TYPES THEY NEED FOR THEIR SPECIFIC PURPOSE. PLANNING ON EDITING YOUR VIDEOS? -­ UPLOADING TO YOUTUBE OR VIMEO, TO SHARE WITH FAMILY? -­ YOUR VIDEOS ENCODED FOR IPAD, IPHONE. 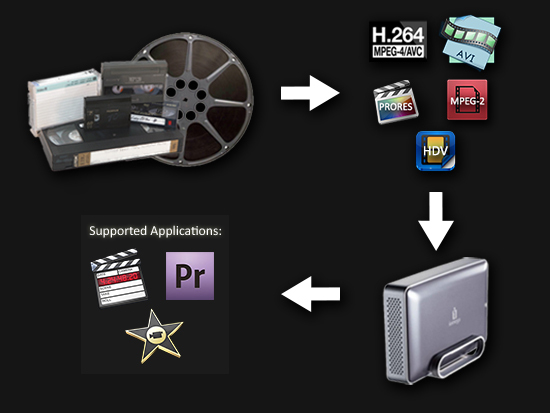 PARTIAL LIST OF DIGITAL VIDEO FILE TYPES WE CREATE. 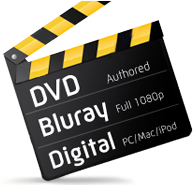 WE DON’T STRAIGHT TRANSFER YOUR VIDEOS TO DVD, THEN USE SOFTWARE TO “RIP” OUT THE VIDEO FILES FROM THE DVD. THIS IS A CHEAPER PROCESS THAT CREATES POOR VIDEO AND SOUND QUALITY WHEN FINAL FILE IS “RIPPED”. WE DON’T USE “OVER THE COUNTER” CONSUMER CONVERTERS. WE DON’T TRANSFER CONTENT YOU DON’T NEED. IF YOU ARE UNSURE OF WHAT YOU HAVE, PLEASE FEEL FREE TO CALL US TO SCHEDULE TIME TO VIEW YOUR MEDIA. WE DON’T CHARGE HARD DRIVE SETUP FEES. WE BELIEVE THIS IS PART OF THE PROCESS AND YOU SHOULD NOT BE PAYING EXTRA. 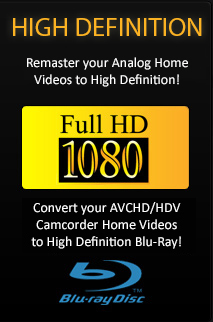 WE DON'T COMPRESS YOUR VIDEOS TO FIT ON DVDS. THIS PROCESS REDUCES QUALITY. WE DIGITIZE AT HIGHEST QUALITY WITHOUT COMPRESSION. EXTERNAL HARD DRIVES ARE NEEDED FOR ALL TRANSFERS. FOR YOUR CONVENIENCE WE SELL MAC & PC COMPATIBLE HARD DRIVES.WITH LARGE QUANTITIES WE INCLUDE 1TB SEAGATE DRIVES. Dear Ray, I am so pleased with the DVDs you made for me from my family videos. Some of the tapes were 34 years old, and it brought back such nice memories to see my children as babies. The DVDs are excellent quality and the menus you designed on each DVD make it very easy to find exactly the scene I want to view. I will happily and confidently recommend you to any friends who need to have their tapes converted.